We haven’t posted much on how the Fusiontable by Aramith goes together, so we took a few photos on a recent delivery to Sherman Oaks, CA to give you an idea of what it looks like. The Fusion Pool Table comes in a giant crate/pallet. It isn’t put together (we do that), so it looks nothing like the finished product. One of the Fusion Table’s best features is its ability to raise and lower from pool table playing height to dining table height. The 7′ one-piece diamond honed slate is necessary for the playing surface to stay perfectly level when in “billiard table mode”. The Brazilian one piece slate is large and very fragile, it must be crated from the factory to protect it on its long journey to the United States. The construction is simple, in theory. But surprisingly the Fusion Table takes much more time to get it setup. Corners must be perfectly aligned as to not disturb the clean lines of the table. 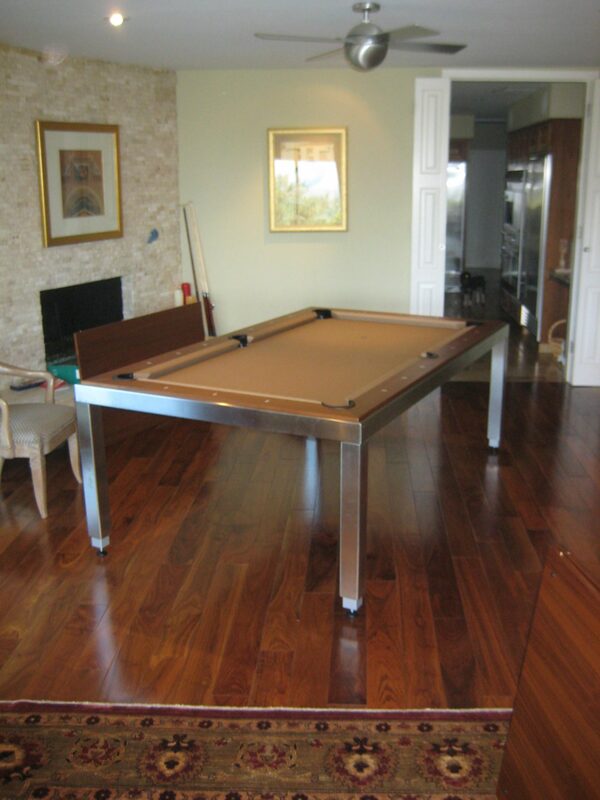 A great deal of time and craftsmanship is involved both in building and setting this specialty pool table up in your home. In fact, a typical Fusiontable setup can take twice as long as a traditional slate pool table setup.